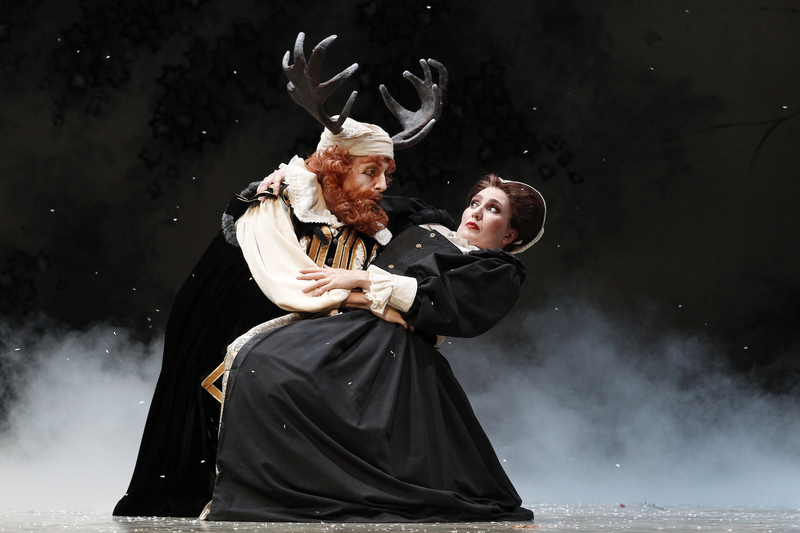 Superb singing and stunning designs showcase the depth of Opera Australia’s talent pool to full advantage in this very merry revival of Falstaff. With an ego as hefty as his beloved belly, fatty Falstaff is swiftly repaid for his misplaced self-confidence as a preening predator. Collecting enemies the way some men collect stamps, Falstaff manages to keep our affection and sympathy despite his monstrous appetite for wine and women. We root for Falstaff, yet delight in the successful schemes of his adversaries. 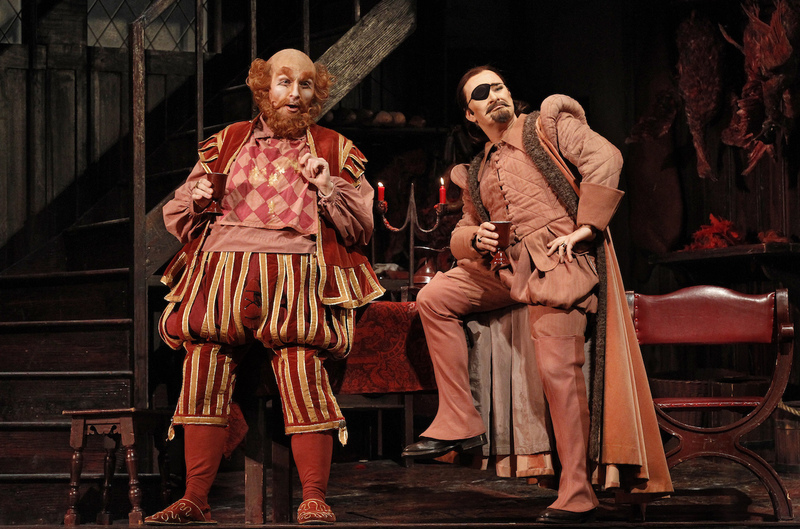 Verdi’s final opera, his second comedy, is blessed with an inspired libretto by Boito, who expanded the popular Shakespearean creation Falstaff from The Merry Wives of Windsor with additional substance from Henry IV. Story is king, as the plot careers along from seduction to humiliation to redemption with nary a show-stopping aria or duet to be heard. The score is an intricate treasure, designed to support and colour the comedic stage action rather than to be the star attraction itself. Maestro Christian Badea seamlessly manages instrumental and vocal music for a truly splendid combined result. In such capable hands, the deceptively difficult score sounds almost effortless, as the musicians and singers juggles contrasting time signatures, rapid patter, massive ensembles and sudden changes of pace and style. Moments such as the tinkling percussion as gold coins are scattered or the definitive brass oomph as the women imagine tossing the laundry basket into the Thames illustrate the witty genius of the composition. Based on Simon Phillips’ 1995 staging, revival director Hugh Halliday shows a sure hand with the comic stylings, overseeing physical comedy that never strays from outlandish to out of hand. The large coterie of characters are all clearly established, and, as the tables are turned back and forth, the audience are always clear who has the upper hand. In a lesson to younger directors who feel the need to add their own humour to save a show, the original intention of Boito and Verdi are respected with winning results. In a supreme example of artistic collaboration, sets, costumes and lighting have been designed to complement each other with perfect synchronicity, and the result is as amusing as it is attractive. Each scene is designed around a colour choice, creating a visually appealing, painterly uniformity. We move from the muted reds of the seedy Garter Inn to the verdant greens of the marketplace then to the fresh yellows of the Ford household. Part of the joy of this concept is the way characters re-wear the same costumes but in the new colour each time. 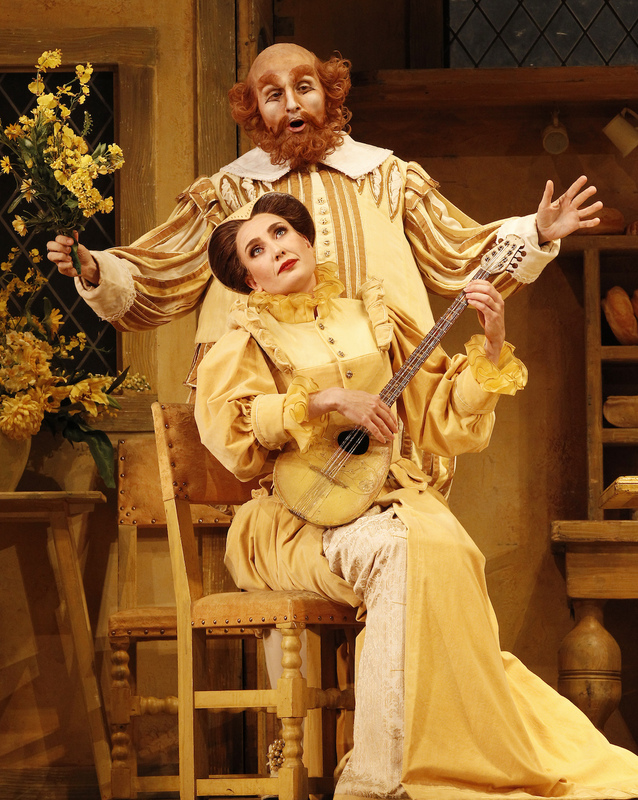 Once the idea is established, there is a cute preview moment when Falstaff presents himself in buttercup yellow just before the transition to the Ford house. Iain Aitken’s elaborate design rotates a two storey central building unit to house each scene. The claustrophobic playing space adds to the visual humour, and it seems that every time a character wants to eavesdrop, spy or hide, there is a door, window or screen on hand. Nick Schlieper places softly glowing lights within each scene to enhance the colour effect. 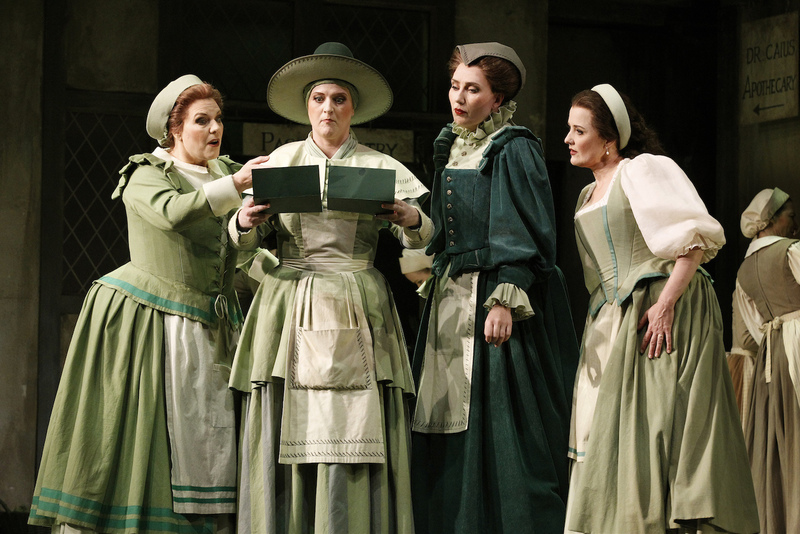 Tracy Grant Lord’s sumptuous costumes are a joy to behold. Richly detailed and expertly tailored, the costumes could almost steal the show (were it not for the towering talents of the cast). Lord aids the storytelling by giving each of the four lead women a distinctive look, and deftly dresses the men playing buffoons one degree back from caricature. The designs reach a high point in the final scene when the stage is filled with faeries and goblins, and the lead women wear spectacular black and white gowns. Warwick Fyfe anchors the show with a grounded characterisation of Falstaff, playing the potentially ludicrous man as a cocky lover who simply believes his own hype. Fyfe’s pure, even baritone tends more to beauty than power, but carries well over all accompaniment and sounds superb in moments of a capella singing. The modesty of a team player shines through as Fyfe delivers a classy star turn. Jane Ede’s bell-like soprano is used to lovely effect as Alice Ford, her height adding an extra touch of authority to her portrayal. Dominica Matthews nimbly makes Mistress Quickly’s tricky vocals sound simple, and presents the character’s devilish machinations with a charming twinkle in her eye. Renowned mezzo-soprano Jacqueline Dark reinforces her established gift for facial and physical expression as Meg Page. As they flit about the stage like the fairies from Sleeping Beauty, Ede, Matthews and Dark work together with palpable warmth and camaraderie. 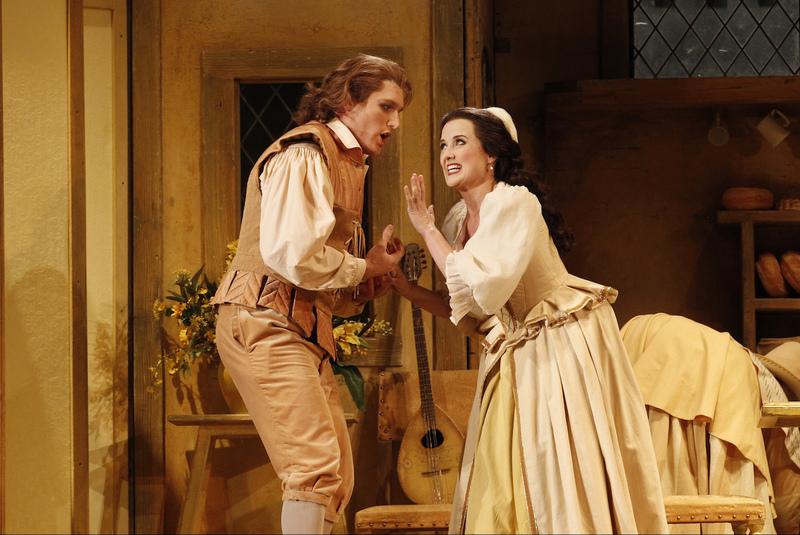 Taryn Fiebig is in fine form as coquettish lass Nanetta, partnered ably by highly impressive tenor Jonathan Abernethy as Byronic youth Fenton. The snatches of sweet duets from the young lovers add a different, and lovely, voice to the music. 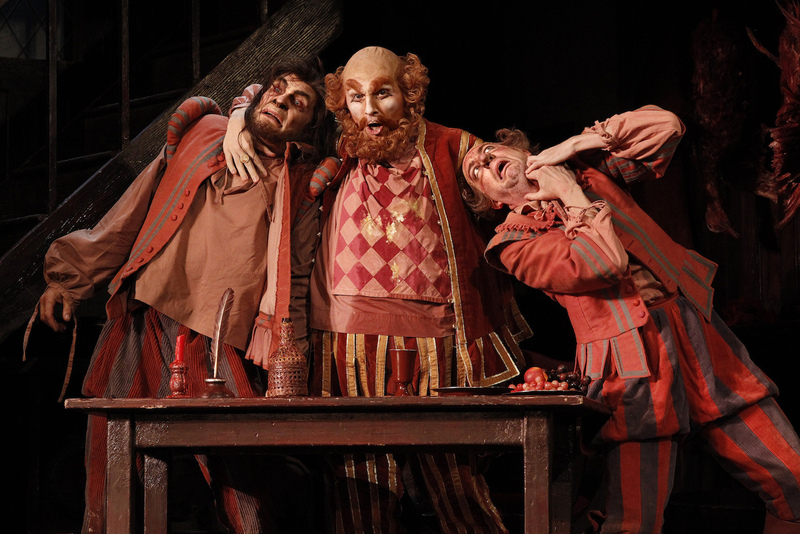 Kanen Breen as Bardolph and Jud Arthur as Pistol add masculine physical humour to the mix, forming a Three Stooges-like trio with Falstaff as the straight guy. Anthony Hunt’s chorus preparation is reliably pristine, the performance in this season boosted by the presence of such rising talents as Jacob Caine, Nathan Lay, Brenton Spiteri, Anna Louise Cole, Eva Kong and many others who have all been seen elsewhere is leading or featured roles. 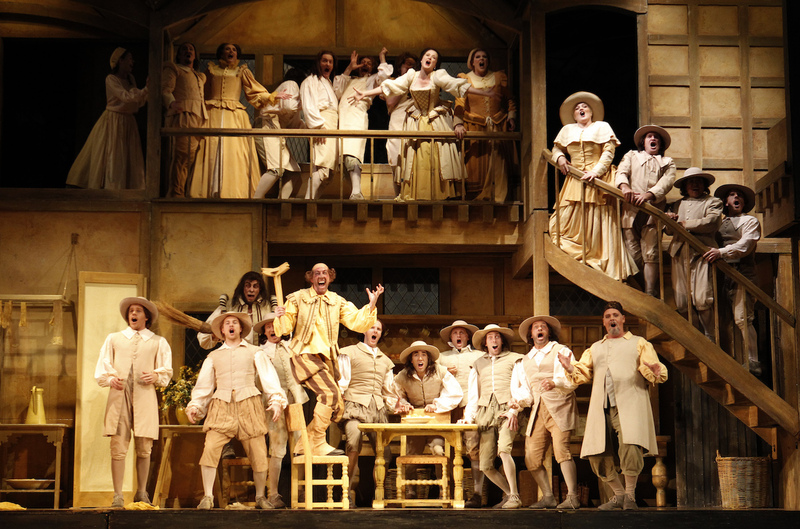 A welcome deviation from the chocolate box repertory, the sheer delight of Falstaff is not to be missed.